Duralumin cantilever brake, no mark engraved on it. Mafac Frein Cantilever Criterium Fin des années 40 50 et 60. Brake cantilever MAFAC Criterium 40's 50's 60's. Poignées Mafac 1ere Génération fin 40. 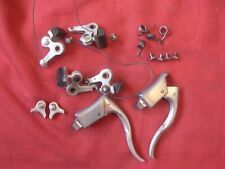 Brake levers MAFAC first generation end 40's. Avec rare poulie de tirage arrière MAFAC, et l'accastillage classique MAFAC. Cantilever calipers MAFAC CRITERIUM. NOS rare passage guide câble à roulette pour freins MAFAC cantilever. Set MAFAC "CANTILEVER" complet (étriers. poignées et accessoires ) en bon état. Ensemble COMPLET MAFAC "cantilever (de 2 étriers, 2 leviers et les accessoires) "cantilever" . en très bon état voir les photos . nota les. poignées sont rares d'époque et en très bon état . Rare passage guide câble à roulette pour frein MAFAC cantilever. 1 PIECE BRAKE CANTILEVERS LEFOL MAFAC. Complete Mafac RAID Center pull Brake Set. These are the ultra rare version for cantilever stud mount. We're the online bike parts dealer for rare components and spare parts for your restoration and repair. Mafac Criterium Cantilever Brake Set. Here you will find original pieces of cycling history that cannot be found anywhere else. Brake levers missing clamping screws. good condition with center pull cables in tact. Complete - includes seat & stem hangers. Up for sale is a set of Vintage Mafac cantilever brakes. Really nice set that is perfect for a vintage build. This is a Full Set although this includes a non-original brake pull and an attachment for the wire to cantilever. You’d only notice if you looked very closely! They are in good shape although a proper polish would make them shine. brake pads are not that old and useable. Mafac Brake Cantilever New Parts Kit. And Long Straddle Cables With Ball Ends Used On Mafac Ccantilever Brakes. Second Pic To Show The Brakes Only . A Mafac cantilever brake - a bit dirty. Works For Any Centerpull Brake Not Just Mafac. This Fits Between The Seatbionder Bolt And Seatlug To Act As A Cable Housing Stop To Center The Brake Cable For Centerpull Brakes. Mafac Cable Guide/Stop For The Rear Brake. Criterium Super De Luxe. Country of Origin. NOS Mafac Criterium Cantilever full brake set! Model: Criterium cantilever, set includes braze on parts. 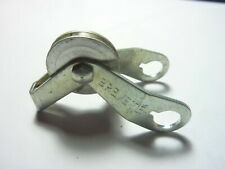 Mafac brake cable hanger / spacer for front center pull brake calipers. for English or Italian fork steerers. Mafac Brake Cantilever Straddle Cables With Ball Ends. THE LAST FEW SETS, THE BALL IS NOT PERFECTLY ROUND, MAKES NO DIFFERENCE IN INSTALL, JUST BEING CLEAR. THEY ARE STILL THE ROUND HEADS JUST NOT PERFECT SPHERES. Mafac brake cable hanger / yolk for front center pull brake calipers and cantilver brakes. We're the online bike parts dealer for rare components and spare parts for your restoration and repair.